Bargain hunters rejoice! Colorado’s great outlet malls are overflowing with amazing deals that are calling shoppers' names. All of Colorado's major outlets are located near other top attractions, so the non-shoppers in your party will have plenty to keep them busy while you fill your trunk with shopping bags. What’s Unique: This Colorado outlet near Denver is a behemoth shopping center on the western part of the metro area. Though not strictly an outlet mall, some of the most sought-out outlet stores such as Neiman Marcus Last Call, Coach, H&M, J. Crew, Lucky Brand, St. John Outlet, Banana Republic Factory Store, Le Creuset and many others are sprinkled among regular retail favorites. A circular building design means you can park in one spot, complete a full shop-til-you-drop circuit and end up back where you started without having to backtrack. A Recent Find: A pair of Gucci sunglasses for more than 70 percent off at Neiman Marcus Last Call. 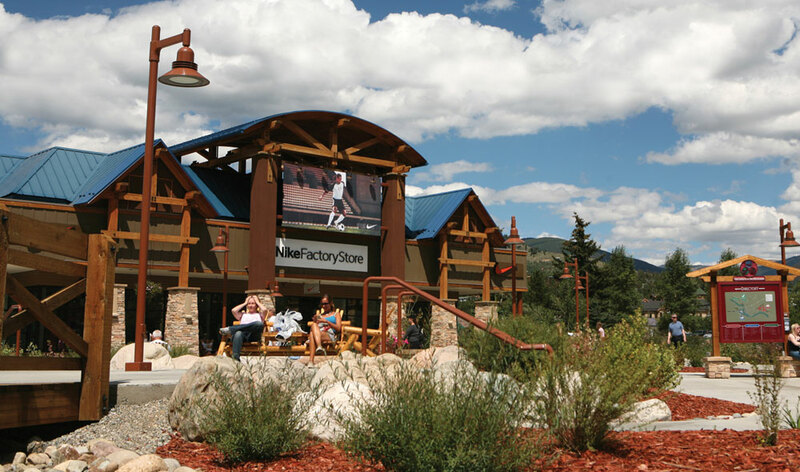 What’s Unique: Located in Summit County near several ski resorts, this outlet center’s dramatic mountain surroundings make you feel as though you’re getting some quality Colorado outdoor time, even while you’re shopping. There’s a freshwater stream running through the property, where husbands often are content to reel in a few catches while their wives make the rounds to the dozens of outlet shops. A free shuttle whisks shoppers among three different outlet “villages” throughout Silverthorne. Notable stores include J. Crew Factory, Polo Ralph Lauren Factory Store, Calvin Klein and Coach Factory Store, as well as new stores that include GoLite outerwear, Under Armour and the Guess Outlet. A Recent Find: Adorable and quality baby clothes for all seasons at impressively discounted prices at Carter’s Outlet. What’s Unique: This sprawling complex offers fresh, Rocky Mountain breezes and stunning sunset views of the foothills to the west. The scene is complemented by “sale” signs that lure you into yet another shop for a fabulous shopping experience. New Not Your Daughter's Jeans, Lucky Brand, Under Armor and Bose outlets have been exciting shoppers lately, as well as the usual great finds at the especially well-stocked Gap Outlet, always-bustling Nine West Outlet and luxe-for-less goods at Saks Fifth Avenue OFF 5th. A Recent Find: A pair of go-with-everything ballet flats at Nine West Outlet for more than 50 percent off the original price. What’s Unique: About an hour north of Denver on the expansive Front Range, the Outlets at Loveland serve the area’s suburban and rural population with popular stores such as a Carhartt outlet, Toys “R” Us Outlet, Nike Factory Store, OshKosh B’Gosh and plenty of others, including new stores like Under Armour and VF Outlet. Stop in the mall management office for a free savings card, good for dozens of discounts throughout the center. A Recent Find: A timeless cable-knit sweater from J. Crew at a fraction of the price seen in the catalog. What’s Unique: This recently opened outlet, located 20 minutes north of Denver, is a LEED-certified project that used recycled and locally sourced materials in the creation of the shops. The architects were inspired by the Front Range and used heavy timber to create open transparency to frame the natural setting that surrounds the mall. The outlets are a mix of designer and popular lifestyle brands including Nike Factory Store, Marmot, Cole Haan and Columbia Factory Story, all at up to 65 percent off every day. Shoppers can even join the Denver Premium Outlets’ VIP Shopper Club for extra deals. Photo: Courtesy of Outlets of Colorado.